Over the last month or so there have been a number of natural disasters – Forest Fires in California, Flooding in South Asia, Hurricane Harvey in Houston, a number of Earthquakes in Mexico, Hurricane Irma in the Caribbean and Florida, and Hurricane Maria in Puerto Rico. Lives have been lost and people’s homes and livelihood have been destroyed. I am saddened and my heart is heavy. Sending money does not feel like enough and at times this heaviness and sense of hopelessness can become overwhelming. I think to myself mother earth is not happy and I understand why. We as a nation have shown a lack of reverence for the only natural home we have. This not only saddens me, but angers me because for many years we have disrespected this home with our overuse of natural resources and the increase in our carbon footprint. Now mother nature must balance things. When I am in need of an extra dose of comfort I apply, the dōTERRA Console® Comforting Blend, to my wrist and heart area and I breathe in the aroma while saying a prayer. Afterwards I meditate and listen to inner guidance on how I can assist those in needs as well as how I can be more reverent to Mother Earth. 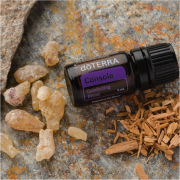 The dōTERRA Console® Comforting Blend, uses gentle floral and tree essential oils to help renew my hope and dispel heavy feelings of sadness. In times when your emotional strength is wavering, I encourage you to turn to dōTERRA Console to dispel hopelessness and lighten your burdens. Once your energy has shifted I encourage you to give thanks to mother earth and ask what YOU can do to assist those in needs as well as to honor our natural home –EARTH. Please share what you do when your heart is feeling heavy from all the natural disasters that have impacted so many lives. Want to know more about this essential oil or other essential oils to support your wellness? Click here to schedule a free 30 minute wellness consultation. I’m feeling overwhelmed for sure- mother nature, political chaos plus exciting but still stressful personal/professional stuff. Thanks for the guidance and hope! You are definitely right on about the fact that we need to feel these emotions and let them flow. Holding them in will not help anything. Thanks for sharing that it is OK and even necessary to feel. Sharing! It never occurred to me to use oils which means working with brain chemistry to work with those feelings. It is a great idea to augment getting involved supporting causes that support environmental and human justice, which is what I do. Purchasing fair trade and organic products is empowering and a win/win for the planet, those involved in growing and producing and the consumer.. It is my understanding that doTERRA products are fair trade and organic. Is that true? Thanks for your post.